BMW has broken one of its rules and also expanded into new territory with the new 2-Series Active Tourer: firstly by producing a car with front-wheel drive and then creating its first MPV at the same time. 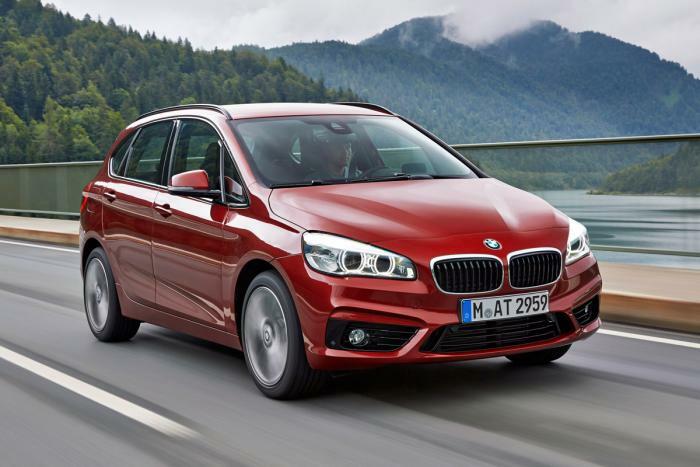 The new BMW 2-Series Active Tourer can be thought of a ground-breaking model for the Munich firm for those very two reasons and marks a huge change for the company in terms of direction. Thanks to the exponential success of the MINI, BMW can afford to explore such an area of the market as this and the Active Tourer is even built upon the same architecture as the popular hatchback, albeit stretched to increase space inside for passengers. It could be seen to be a brave move by BMW to arrive in the MPV market, a sector where people are leaving for the joys of fashionable SUV Crossovers. In addition, the Active Tourer faces some hefty competition in the forms of the Mercedes B-Class, Ford C-Max and Volkswagen Golf SV. Perhaps one reason many are flocking to the myriad of stylish SUVs is the way in which MPVs are usually so limited in how visually engaging they can be. However, with some slick styling traits from its sleeker offerings, BMW has managed to accomplish one of the better looking models in its class with the Active Tourer. The manufacturer’s trademark kidney grille is front and centre on the 2-Series MPV, while resting just below the headlights and is an arrangement seen already on the new 6-Series and 4-Series. 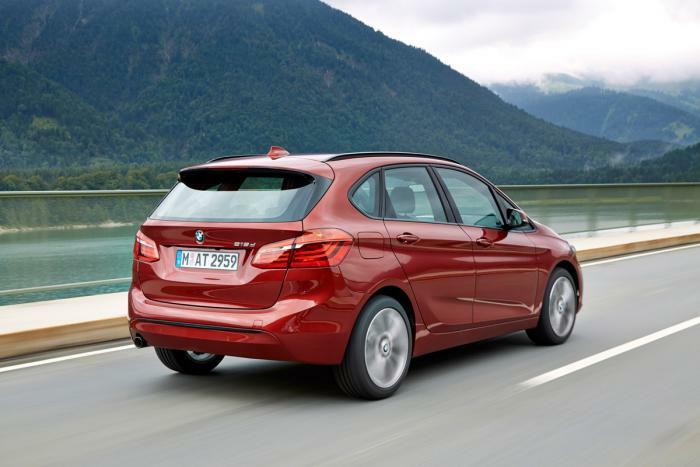 Panel creases and kinks help to make the Active Tourer’s bulk, something which BMW does well to keep the car looking as trim as possible by breaking up the car’s lines. BMW might very well have instantly become class-leaders in terms of interior quality with the Active Tourer. 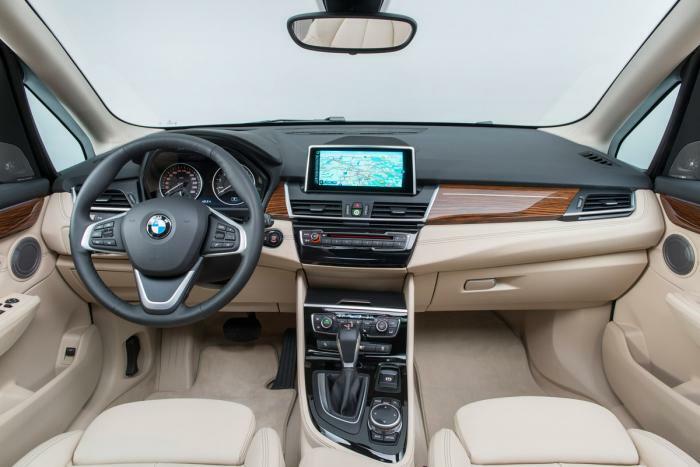 A option-laden lush cabin makes the larger 2-Series a fine place to be thanks in large to an abundance of leather and red stitching, as well as aluminium inserts in the dash and centre console which help bring a premium feel to the interior. Just the two engines are available at the launch of the new BMW 2-Series Active Tourer: one diesel and one petrol. The 148bhp 2.0-litre diesel features in the 218d-badged Active Tourer and is likely to be the model’s most popular variant, predominantly due to its economic capabilities that achieves 68.9mpg and CO2 emissions of just 109g/km. For one of BMW’s larger and less sporty examples, the 218d manages 0-62mph in 8.9sec but there is a slight lack of refinement at speed when wind noise is quite noticeable; however, a supple ride certainly helps to make up for this. As for the petrol offering, BMW has employed MINI’s new 1.5-litre three-cylinder unit. 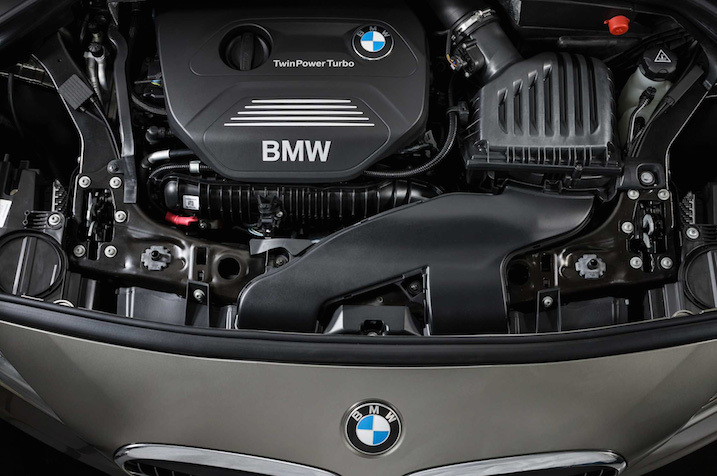 The first three-pot engine in a BMW is more refined than the diesel alternative in the Active Tourer and returns a reasonable 58mpg and emits just 115g/km of CO2. Space inside the BMW 2-Series Active Tourer is not going to be what takes sales away from the likes of the Golf SV or B-Class, that’ll be the fine interior quality and driving dynamics of a car of this size and shape. The Bavarian offers less room than its rivals at 468 litres of space, or 1,510 litres with the back seats down that can be flattened at the flick of a switch. 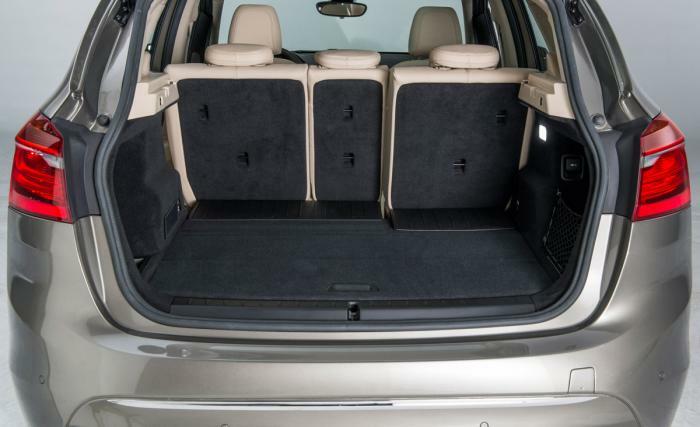 The rear seating arrangement is a traditional bench for three individuals, and with shorter overall dimensions after being based on a stretched version of the MINI’s structure, the BMW has decent but not class-leading leg room, although isn’t too bad for head room. Those in the front can enjoy numerous storage areas and a comfortable central arm rest that doubles up as more room to put possessions; a great versatility of adjustment means that the driver can be comfortable no matter what their personal dimensions. Going up against the Golf SV once more, the 2-Series Active Tourer wins this round when it comes to the fuel and tax bills, with the BMW’s diesel achieving 3.2mpg more and a tax band lower on CO2 compared to the VW for the same engine displacement. The 1.5-litre petrol is a sound option for those after a little more of a quiet journey and costs £2,000 less than the 218d.